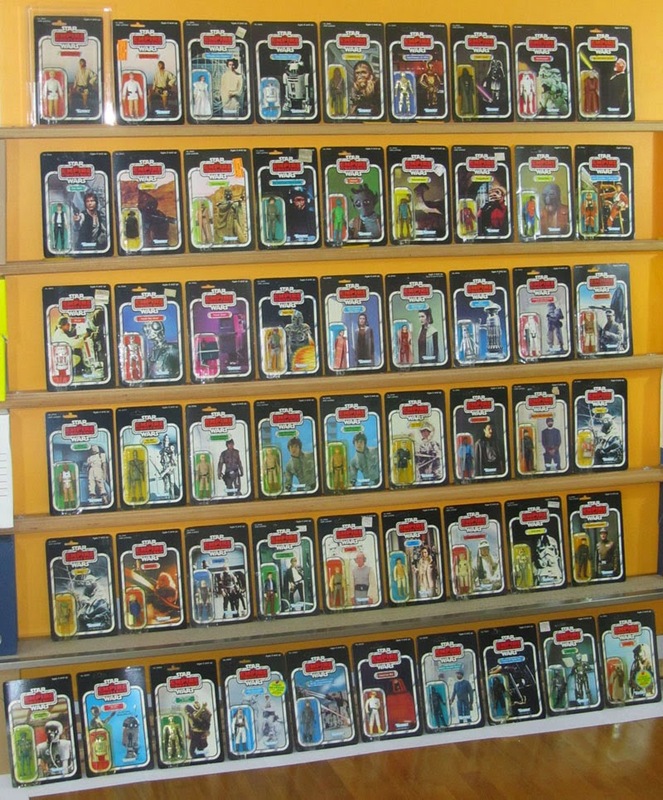 Assembling a full set of carded figures on the same particular range/logo is quite a goal for many collectors, not only Star Wars related, and quite a challenge on its own. Although I hadn't set any goals for the year 2014, I consider it to be a true accomplishment for my collection. The 'trigger' and the path to assemble this set were pretty much the same as for any collector: when I started to collect carded figures, I used to buy any character I didn't own on any cardback that was available within my remaining budget. Half-way to a full carded set, my collection was heterogeneous and I decided to focus on French Meccano and Trilogo figures (well, you know that story), and ESB figures from the American Kenner line (which I quickly focused to offerless - that is cardbacks without any promotional offers printed or stickered onto them). The ESB Offerless line is my favorite - it combines the terrific display of a full picture with the logo from the all-time fan favorite Star Wars movie. It also gives the opportunity (or difficulty) to assemble a full ESB set of figures, while focusing on a particular offer will restrict the number of characters since they were not all produced for each offer. 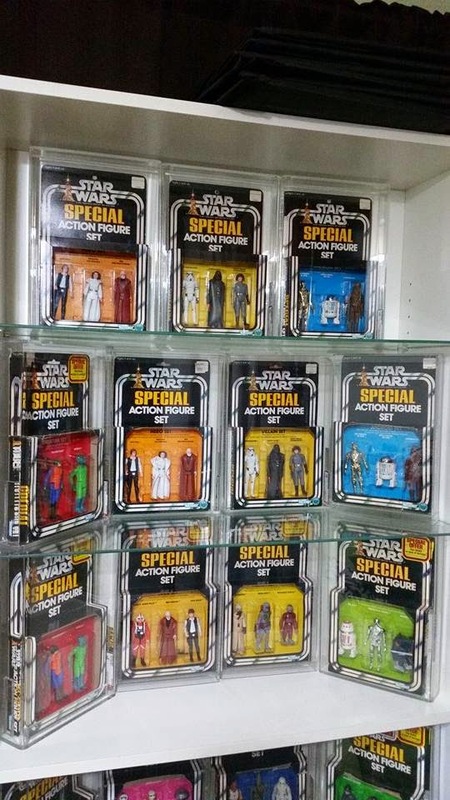 Although the Star Wars line counted 48 different figures by the end of the ESB line, a full ESB set with figure variants (eg. Lando w/ no teeth, Luke blonde/brown hair...) reaches a 55 figures count, plus one if offerless 4-LOM included (an offerless, but Australian release). For the fun of collecting, some characters are a real challenge to unearth, like regular R2-D2, Luke Hoth, Tie Fighter Pilot, and the famous R5-D4 droid, on 31-back card. The usual heroes (Darth Vader, Boba Fett...) are not quite challenging, but always command a premium price, especially on Luke blonde/brown hair and Han small/large heads. Collecting is also a matter of luck - I happened to buy R5-D4 -the most challenging one- for a 'bargain' from a low profile U.S. seller eBay auction back in 2008, which resulted in careful competition. To conclude.... a picture of my set. 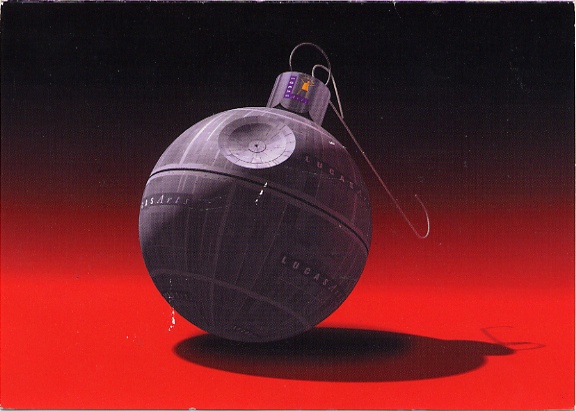 One of the great Star Wars traditions that Lucasfilm began in 1977 and continued with the various Lucas companies through 2013 was issuing company Christmas cards, frequently with Star Wars themed designs. These cards were made available to company employees and sent to members of the cast and crew involved in the production, marketing, and licensing of the Star Wars movies. In the early years, renowned conceptual artist Ralph McQuarrie designed several cards based on Star Wars characters Yoda, R2-D2, and C-3PO. McQuarrie continued designing Lucasfilm cards through 1995. 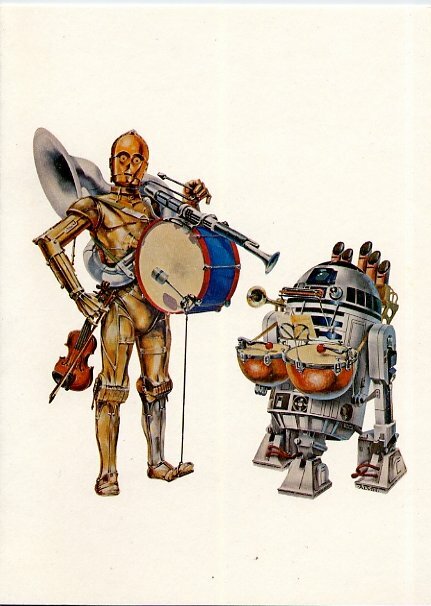 John Alvin's "Concert Poster" art was used for the 1978 US card while McQuarrie's shopping trip with the droids was used for the 1978 UK card. 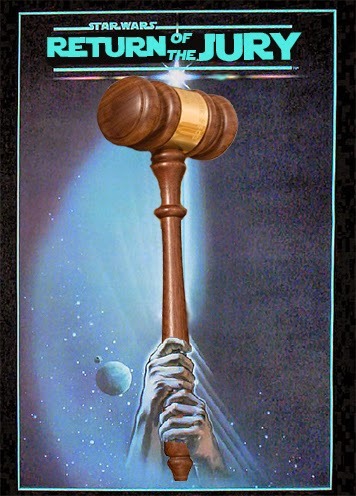 In later years other artists created unique and clever Star Wars themed cards for the Lucas companies, and by the mid 1990's all of the Lucas companies (Lucasfilm, Lucas Licensing, Lucas Learning, Lucasarts, Lucas Digital/ILM, JAK Films) were issuing separate cards. 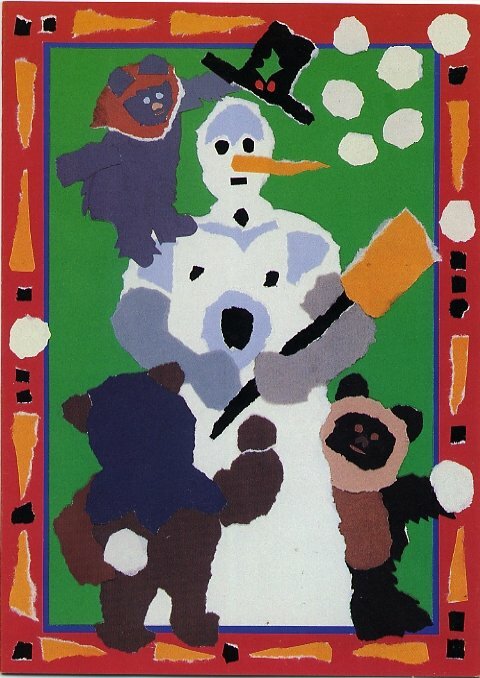 The Lucas companies merged their cards into a single company card starting in 2003, and this practice continued until 2013, which was the last year they made printed cards for company employees. Starting in 2014, Lucasfilm began using online cards in place of the printed cards from years past. Here's an interesting interview with some of the folks involved in the old Christmas in the Stars album. 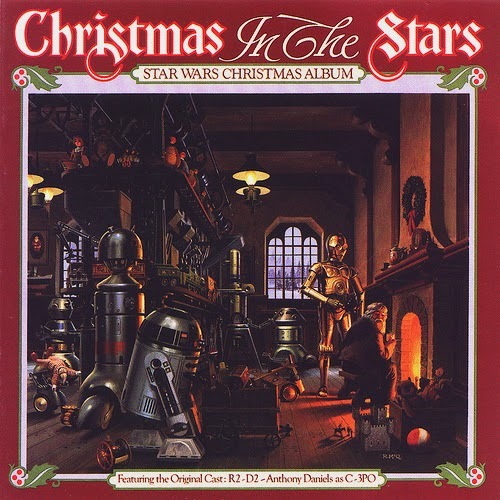 Fans might remember (or curse) it as the Star Wars Christmas album, released in 1980. It's like the Holiday Special, only with less Harvey Korman and more Jon Bon Jovi. The interview is quite interesting though, since it discusses the original goals of the project as well as alternate lyrics and lost songs from the album. Pretty interesting read! Welcome to a special edition of the MarketWatch for the month of December. Now a lot of you have all your Holiday shopping done and may have even celebrated the season with your family and friends. That doesn't stop me from bringing you a quick recap on some of the best deals and gifts leading up to the Holiday season from our favorite site eBay. This month we’ll focus on 10 items all under $1,000 that would make great gifts for the Vintage collector. I wanted to bring to light some pieces that may not be top of mind for all collectors, but should be a home-run as gifts due to the fact that each has a cool aspect, a lot are rare, and a lot were pure steals given the influx of items listed during the Holiday season. Unlike the usual monthly updates, I’m covering items that may fall at the lower end of the price band, as I typically discuss items on the high end and ultra rare. To my surprise if you’re stalking eBay you can really find great deals on high end and rare items. 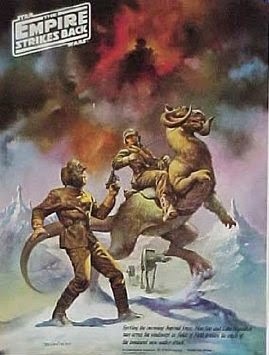 Thus here we have a listing of great items that covers the gamut of Vintage Star Wars, without just focusing on the highest ticket examples. So although it’s a MarketWatch update, it’s a little bit reversed from the normal coverage. So let’s get started with our list! An odd duck to start the list is one of those white boxes with figures inside, our favorite vanilla segment of the Vintage line; a Mailer. In this example we have one of the 20+ sets created for retailers during the Return of the Jedi toyline release. This piece from what we can see is a sealed set, and has been cased by AFA, although not graded. 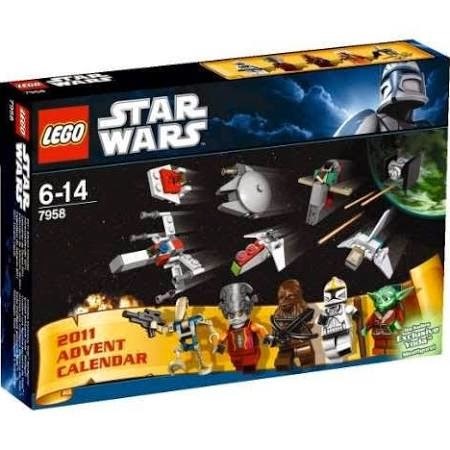 These sets are fairly common given the number released, but this particular set is one of the exceptions to that rule as it includes Darth Vader and two Snowtroopers. The figure combination is always key with multi-figure mailers as it really drives the demand and rarity, and in this case it’s one of the top few released in the ROTJ series. With a non-sealed version with open figures going for nearly $500 earlier this year it’s easy to see why this piece made the list. 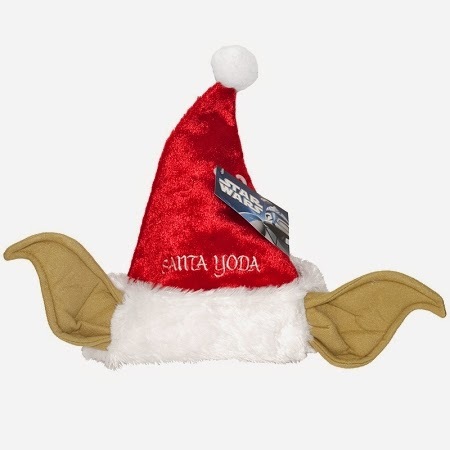 If you have an ROTJ collector on your Holiday Gift list this would have made you look like a superhero! Next up on the list is the coolest Ewok item of them all, the Ewok Battle Wagon. Fully equipped with a battering ram and a giant skull from some other Endor inhabitant, it’s quite simply the best of the best in the world of the furry little critters from Endor. Add in the fact that it’s one of the few vehicles created for the Power of the Force line and you have yourself a great gift for any collector out there. With an AFA grade of 80 and a price tag under $500, this one was a steal as like examples have sold in the $700 and up range consistently for the past few years. Number three on our list isn’t exactly the cheapest example of the figure, but ask any Han Solo collector what the toughest cardback to find in good condition with a clear bubble is, and they will quickly point to the alternate photo Jedi cardback. Like most of its alternate photo counterparts such as Luke Gunner and Tatooine Fett, collectors of all kinds gravitate towards it; it’s a great example of how easy it can be to reinvigorate a carded figure that has been out for over 6 years. This particular example is actually pretty rare given there are only a handful of clear bubble examples of them, with very few that would make the AFA 85 grade. 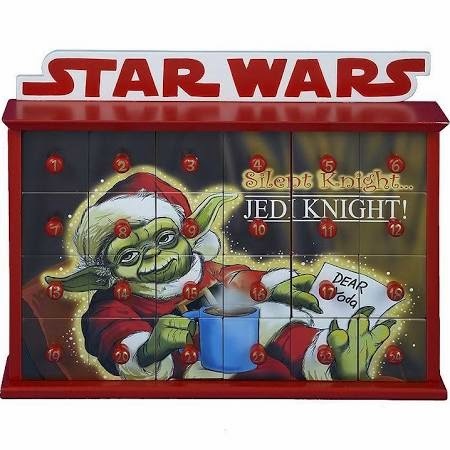 A great item for your Star Wars loving counterpart! Coming in at number four is our Vehicle to make the list. Something that could make the regular MarketWatch because it’s simply the best example of one out there, we have an AFA85 B-Wing fighter. Not the cheapest per capita, but if you have an extremely particular collector that you’re buying for, this is a great piece for what you get. Because of its size there just aren't that many B-Wings out there that can pull an 85 -- Making this one of the best examples of this item to ever make it’s way through Roswell, GA. It’s a great item and although you can get an ungraded piece for under $300, it’s hard to say that the condition and casing of this aren't well worth it. Rounding out the top five of our list, is a nice complete boxed example of the 2nd best Bounty Hunter (yes I just called it) in the Galaxy, IG-88. Some may argue that Bossk or even Dengar holds that title. Well if they do where they hell are their 12” figures, huh? This piece always stands out regardless of its company. It’s truly a fan favorite and being the rarest of the 12 inch production figures is like being the hottest girl at the high school dance, so point A proves B and so on. Not being a 12 inch collector myself, I have always wanted to keep one of these in my collection and many collectors share my sentiments on the topic. Thus, he’s taken our number five position. Coming it at number six is a an unloved item that in its own way is so cool. Like many of the early Star Wars playsets, the Rebel Command Center is more cardboard than playset. But with the cool three dimensional cutout and really the only Rebel home base playset in the entire series it has a cool place in the pantheon of Vintage Star Wars. Given its rarity, it’s easy to say most collectors don’t have one in their collection. And with its exclusive retail status, great back drop, and figures featured, there are few that would scoff at receiving one of these bad boys. With tons of them on the eBay market over the past decade, it’s hard to call the Vinyl Cape Jawa a rare figure. Sure they demand a lot of money, but at any point in time you can find one out there on eBay with an auction ending pretty much weekly. However that doesn’t distract from the fact that this is an iconic figure and one that most would love to have an example of. Throw in a COA from CIB and a little AFA acrylic, (yes that’s three acronyms in one sentence) and you have a great collector’s item that would be appreciated by the most avid collector, to the most casual. Moving from one expensive loose figure to another, our number eight spot is held by our old friend the Double Telescoping Lightsaber version of Luke Skywalker. Without sounding completely repetitive, this figure much like the Vinyl Cape Jawa is rare in a way, but also readily available with auctions ending weekly on these guys. Most that you see trade on the market are graded these days, and I think that’s a good thing. The loose grading of figures is one area that I have a hard time debating with anyone on in terms of legitimacy as it makes the figure look iconic, just my two cents. Just like the aforementioned Jawa, this figure is great for any collector with any focus as it’s such a well-known and desirable piece. Although they are readily available most collectors don’t have one, and I don’t know many that wouldn’t love to have this piece, even if there not a loose figure collector. Thus it’s gifty, rare and can be found for well under a grand. The number nine position belongs to another steal of a very rare figure, the Droids release of Boba Fett. I won’t pine on about how great Fett is as a character, or the fact that he demands more per capita than any other character, or that he has such a cool persona...okay I’ll stop. Simply put, you have the rarest version of the most sought after figure in the production series, complete with a solid cardback and what appears to be a clear bubble. Whether you’re a Droids fan or not, this is quite simply one of the coolest figures you can get in the overall series -- the artwork is great, the coin is superb, it’s just all around a great item. Add in the great condition and a price tag that’s roughly half of what they normally demand...this made someone’s Holiday just a little brighter. And on to our last auction of the month -- one that should be marked not only by the item itself or the rarity of the item, but more than anything by the price of the item, because people, someone got an absolute steal on this one! The POTF Gamorrean Guard is one of a few extremely tough to find POTF figures, along with the featured figure from last month’s Podcast the At-At Driver, Nikto, Yak Face and Anakin. Most of these demand over $2K for a high end example. Here we have one for under a grand. A buy it now auction with someone that was able to drop it like a steaming lava rock into the hands of a very happy collector. Not only was it a great steal, but it’s a great gift for any collector. The POTF Gamorrean Guard is such an iconic piece that Gentle Giant skipped its ROTJ release in their 12 inch scale line to feature the POTF version given its place in the Vintage community as a rare and ultra-cool item. The Gamorrean Guard in this case received an AFA85 -- the highest grade of any example out there. Thus seeing this piece for the price that we did makes it the most expensive and one of the best gifts we looked at this month. I hope you enjoyed the Holiday MarketWatch. We’ll be back with some of the biggest and rarest items to hit the market in the Month of December this coming January. Until next time, Wampa Wampa. 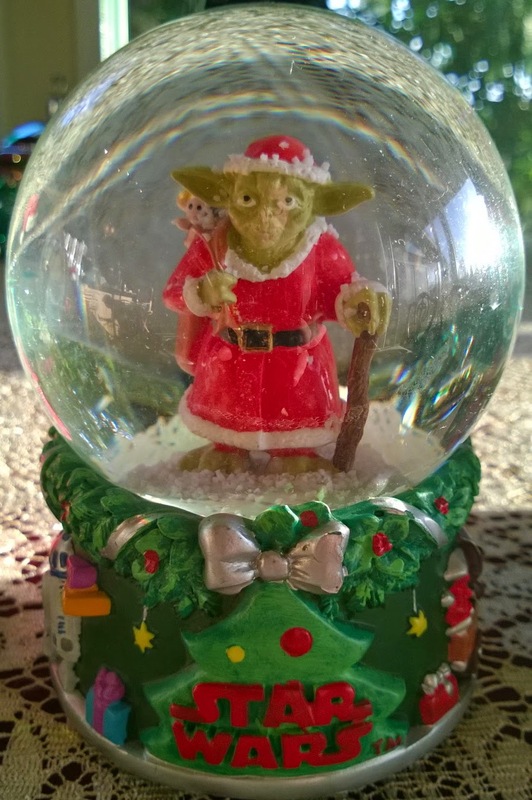 I thought of blogging about my best eBay purchases of 2014. 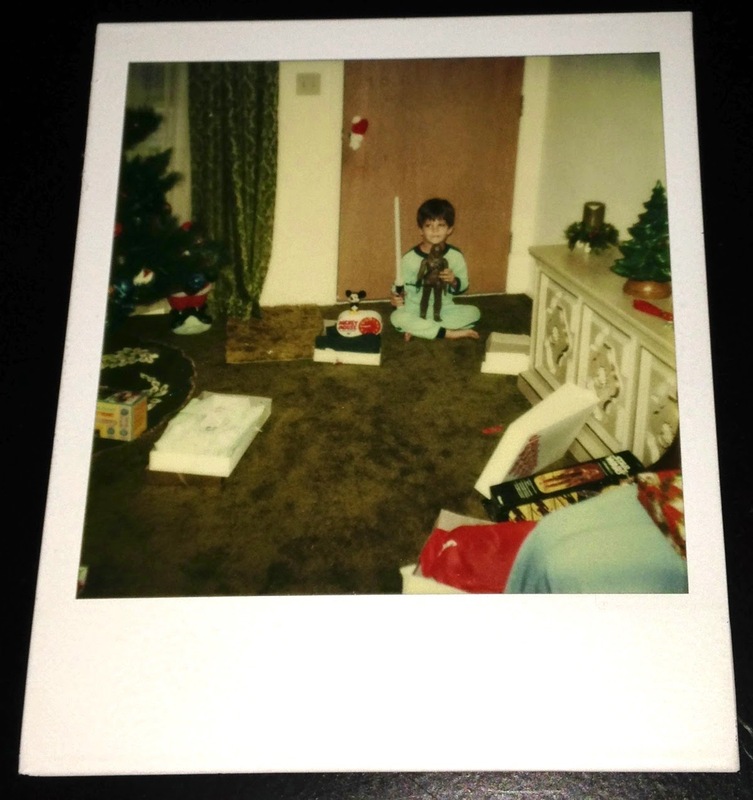 But then I realized there's only one purchase worth mentioning: this Polaroid. It shows a pajama-clad kid -- we'll call him Timmy -- sitting like an Indian on a brown '70s carpet and wondering why that guy dressed as Santa smelled like bourbon and looked sort of like mommy's boss down at the dancing bar. I hate to impose a narrative on Timmy. I can't help it. Every time I look at the picture my brain starts formulating questions and assembling stories. Why doesn't Timmy look happier with his large-size action figure and bootleg lightsaber? Did he have his heart set on Han Solo rather than Chewbacca? And what's he nervously glancing at to his right? Is there an evil clown hiding behind the Christmas tree!? The living room is fairly spartan and sort of . . .transient. Nothing about the photo says "home" or "good cheer." Even the medium of the Polaroid speaks to impermanence. Maybe these people are on the run from something? If so: Run, Timmy! Run until your little heart is set free! What's your take on the photo? Labels: blog, Christmas, Ron Salvatore, Save Timmy! "The principal area of concern was that plaintiff was continuing to use a philosophy which he called 'The Force,' based on the Star Wars films, to counsel juveniles, despite repeated directives not to use this approach. McCormack received reports from other staff members that one of plaintiff's juvenile clients had ridiculed plaintiff's discussions of the 'The Force' and described plaintiff as weird. When McCormack directed plaintiff to cease talking to clients about 'The Force,' plaintiff flatly refused and accused McCormack of violating his free speech rights. Because of plaintiff's agitated behavior, McCormack called True into the office. True advised plaintiff that his behavior might be cause for termination. Plaintiff later agreed to cease talking about 'The Force.' Subsequently, plaintiff told McCormack that he, plaintiff, was in a 'war with the devil' and that his problems were occurring because he was an 'agent of God.'" "Plaintiff related to McCormack that he had intervened in a car chase involving two other vehicles. A passenger in one vehicle had made an obscene gesture to the occupants of a second vehicle. The driver of the second vehicle then began chasing the first vehicle. Plaintiff decided to join the chase and eventually all vehicles stopped at the side of the highway. When the passengers of the other vehicles, two of whom were armed with pipes, got out of their cars, plaintiff approached them and was purportedly able to dissuade them from violence by telling them to 'go with The Force.' Plaintiff viewed his actions as appropriate, indeed mandated, in light of his role as a probation officer with the Juvenile Court." and to cease using 'The Force' philosophy with clients and staff." The situation continues to devolve however and so the plaintiff files suit, arguing a number of different things, most of which don't really concern us. He loses his case though. 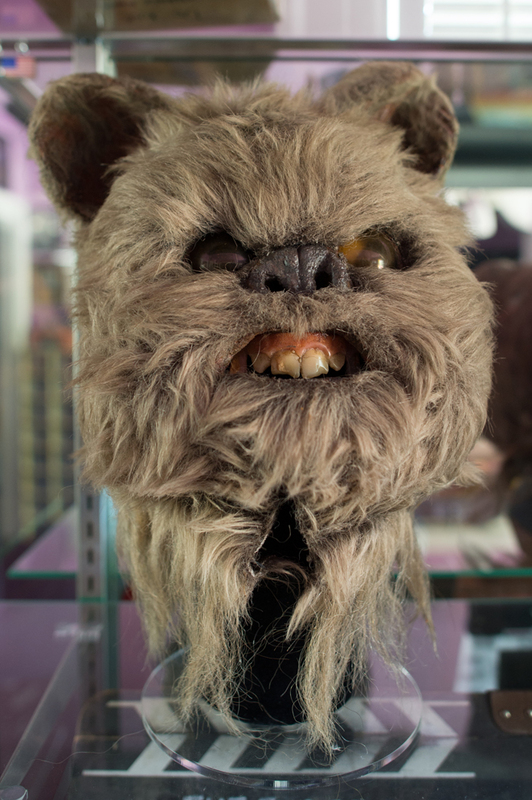 Personally, I like to imagine him wearing this Prop Ewok mask. State v. Taylor, 880 So.2d 831 (2004): A man robs a Holiday Inn wearing a "Star Wars mask." He is sentenced to 49 and 1/2 years of hard labor with no parole. Conviction is upheld on appeal. Unigraphic, Inc. v. Star Wars Corp., 79 A.D.2d 944 (1981): This case deals with a licensing agreement involving Star Wars Corp. and Fox, and whether or not SW Corp. could make licensing agreements with third parties. "...it does not appear that Star Wars had a written agreement with Twentieth Century-Fox Licensing Corporation (Fox Licensing) there are some indications of an agency relationship between them." "Although the documentation contained in the record as to the Star Wars-Fox relationship is fragmentary and inconclusive, it nevertheless discloses that Star Wars through its licensing agreement with Twentieth Century-Fox Film Corporation (Fox Film), the parent company of Fox Licensing, may have exercised control over the activities of Fox Licensing in regard to the licensing of third parties to exploit Star Wars' commercial products." "It appears that the defendants were to share in the profits arising from such third-party licensing arrangements and that in each instance of a proposed third-party arrangement negotiated by Fox, Star Wars had the right to veto the transaction by providing instead a more favorable agreement with a third party of its own choice. The role of Lippincott, vice-president of Star Wars who was present at the meetings of February 21 and 22, 1977 in New York City, is unclear. Defendants' allegations that Lippincott was there solely in the capacity of publicist for Fox Film and only as an observer and not a participant in the discussions is disputed by plaintiff. The question remains on whose behalf he was present and whether he was merely an observer or actively participated at these meeting." Ultimately, the court decides that there exists a genuine question in this case, so it denied Star Wars Corp's motion to dismiss, and sent the case back to down for trial. "I find it very amusing that the defense used was I was a Publicist so the court is asked the throw the case out.... Hahahahha... Now I'll have to rack my brains to try and remember who Unigraphics is, and what this suit could be about." "Anyway, the Unigraphic's case is against Star Wars, so [the] link has to be a suit about an early printing job. The suit is against Star Wars Corp, which was later folded into Lucasfilm. I've tried to figure out who Unigraphic was but can't remember. This probably has to do with printing plates, negatives or something of the sort... I'm guessing that because the company's name is Unigraphic. Was SW/20th Century trying to get back plates? Hmmm... This ties into what I was saying about all those print runs of things like the triangle logo or Bread Cards... Printing off early Star Wars stuff is like printing money, 'cept as far as the Feds are concerned, it's not 'illegal.'" 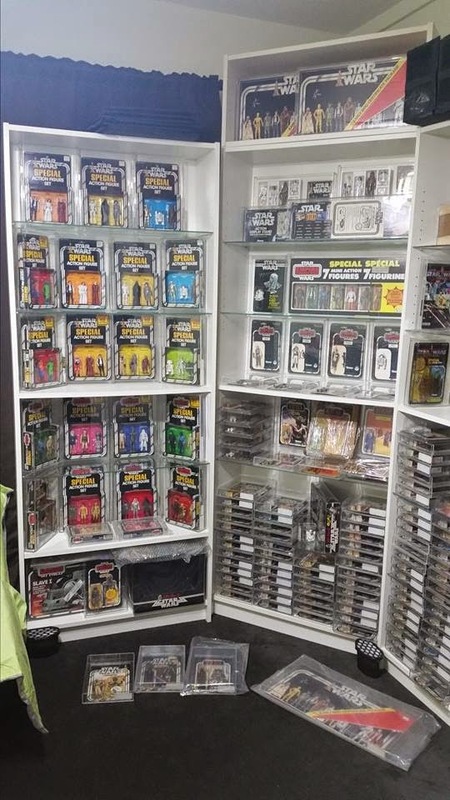 Collector and SWCA Editor Isaac Lew was able to confirm that Unigraphic was indeed a printing company, but just what consumer product they could have been printing for Star Wars Corp at that early date remained uncertain. "Ahhh... the date has joggled my mind. On Feb 21 & 22, 1977, Marc Pevers and I were looking to license Star Wars at the Toy Fair. Marc was 20th Century and I was Star Wars Corporation. This is what I think the suit is about. Marc Pevers and I met with this guy who claimed he had connections to set up deals with Coca Cola and others. The guy tried to claim he had access to a broader licensing arena than he did. Well, turns out this guy hadn't the connections to set up a deal... Coke is split into two parts. There is Coke Syrup and Coke Bottling. When it comes to things like McDonalds and other fast food companies, they deal with Coke Syrup. When it's Coke in stores, it's Coke Bottling. These two entities have distinctly different territories they cover. The guy from Unigraphics claimed he set up the deal with anything we did with Coke, which he didn't. His suit was like Lynn Pressman's suit, completely unwarranted. If I remember right, he lost the suit... That's the story on the lawsuit. What is interesting is how Star Wars Corporation used as its defense the fact I was not an employee of the Star Wars Corporation. By claiming I was not authorized to license, they said the suit was without merit. Hahahahah.... what a joke. This is an excellent example of how the corporate wheels were put into motion to wipe me out from its history. I would appreciate it if anyone could find a link to the case filings. Star Wars Corporation's defense strategy is actually defamation. And yes, George had to know about this strategy because he was kept apprised of legal filings." I looked up the case through the NY court system, and evidently the two companies continued to fight about this issue into the 90s. The case was finally settled pretrial on 1/29/1991 for $450,000. I have no idea why a contract case would take them from 1978 to 1991 to reach a resolution, but that's what it's looking like happened. The electronic record of the case doesn't include any of the actual filings however, so we can't see what's going on. The case is all part of the public record though. The index number is 013274/1978. Thanks again to Mr. Lippincott for helping solve this mystery! I think Vader just wants it more. He's got my vote. Rogers v. Bradley, 1995, (909 S.W.2d 872): An off topic case involving whether or not to recuse a couple judges because they had appeared favorably in a campaign video sponsored by Defendants. Apparently, the video was a parody of SW featuring "bad" candidates as Vader and "good" candidates as Luke. "After receiving extensive testimony, the Court notes that Vader does not appear to be anything like the powerful Dark Lord of the Sith, Darth Vader, from the epic saga Star Wars. In essence, Vader the dog, appears to be a lovable pet that was rescued from the Humane Society and put to work as a police dog." Fairbanks v. Kenner Products, 805 F.2d 1034 (1986): Kenner employee sues company over racial discrimination, Kenner security saw both Fairbanks (who is African American) and a white employee stealing company property (plaintiff's words), and only Fairbanks was then fired. Kenner introduced evidence of why they treated Fairbanks and the other employee differently. The court sided with Kenner both at trial and on appeal. Hyland v. Kenner Products Co., 1976 WL 561 (S.D.Ohio): A woman files a sexual discrimination suit against Kenner in 1976. Interestingly, the court describes all sorts of meetings she had with the higher ups at Kenner, including Bernie Loomis, to discuss her claims. She seems to have worked in “play-test analyst.” It was apparently her job to spy on the test kids as they were playing with the toys and report her findings to the company. She was earning $11,400 a year though. It's interesting that the court takes notice of the fact that the parties HATE each other. And finally we have some clippings of some other interesting Star Wars related legal cases. The first comes from the Montreal Gazette, September 14th 1978. It discusses a suit filed against Fox by theater owners, because Fox was requiring them to also show a less popular Fox film if they wanted to show Star Wars. The last case is another clipping, this time from The Bulletin on November 27th 1985, and discusses the suit Lucas filed against two groups who were using the term "Star Wars" to refer to President Reagan's missile defense network. 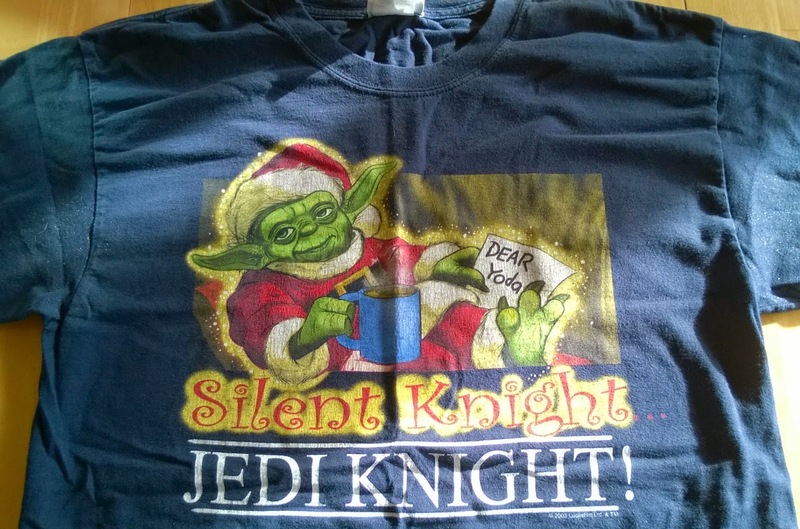 Welcome to our first Limelight Review on the SWCA blog. Each month I’ll take you through a collection of some notoriety that has been published on the web through one of the many websites dedicated to our hobby. 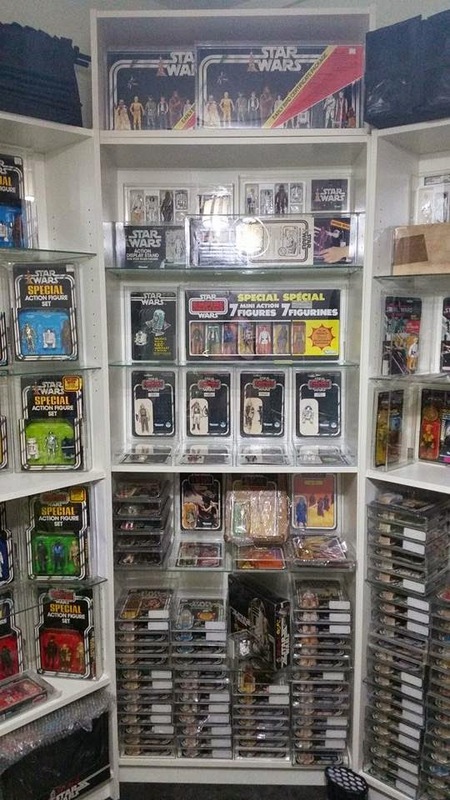 As the hobby is so segmented we want to give some attention to some of the great collections that might only be shown on a finite number of sites, and share them with the greater Star Wars collecting community. The collections covered will span all eras of the hobby, with a mix of Modern, Vintage and Neo Classic eras. There is no threshold for the size or value of the collections covered here; from 3 pieces to 3,000 pieces I’ll be focusing on unique and notable collections that celebrate the hobby and spirit of collecting! For our first review I wanted to start out with a bang... something large in scale, something sprawling in size, and I don’t think you’ll be disappointed. This month we have a collection that covers the gamut of the hobby, MOCs, mailers, foreign release items, really something for everyone. We’re talking one of a kind items, items that have less than a dozen in existence, and some more common, but just as high in demand items from the domestic production runs. This is the collection of Mark Yeo -- collector extraordinaire, lawyer, and by all measures one hell of a nice guy. On a quiet Saturday morning in mid-October I sat in my office in the Twin Cities getting ready for the first of many future calls with other collectors in the hobby. Waiting patiently I looked over my desk at a framed Tron Legacy poster that hangs in my room. The movie which by all standards fell flat with a mis-executed plot is still a favorite of mine for the simple fact that I’m a sentimentalist, someone who craves something from my past being connected to today, and that’s truly where this movie was successful for me. It was representative for me of why I collect and I keep it posted directly in my peripheral vision as it’s a constant reminder of an emotional connection that is hard to be summed up in words, some of us just like things that we can’t explain. This is a feeling that was ever present as I talked with Mark about his collection and dug into some of the why’s and how’s of his great collection. 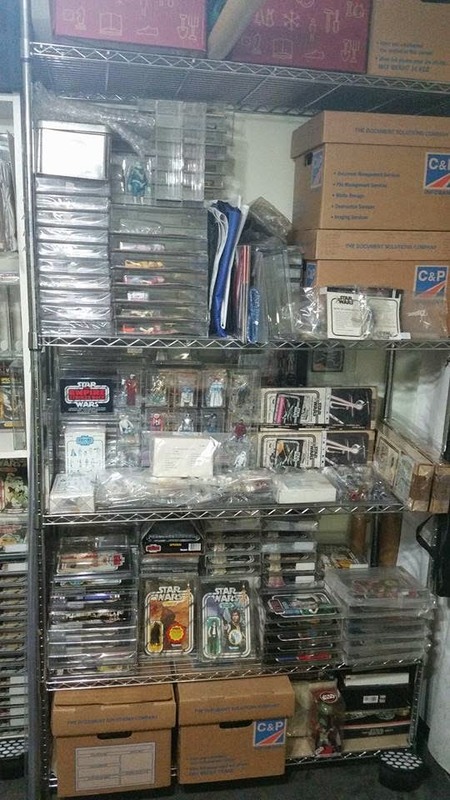 Now I converse quite often with other collectors, but this time was different as it was the first time I was able to spend a lot of time discussing someone else’s collection exclusively. As I waited for a call from Singapore I pondered the questions that I, and super collector Mark Yeo would cover in the coming hours. Being the first to be interviewed is never easy for the interviewer or the interviewee, so I focused on how Mark and I could break the ice and really get into one of my favorite collections to be documented in the past few years. FP: How did you start to collect? MY: 15 years back, I was in Law School, I didn’t have the financial means to pay for school so I started selling a few of my old toys. 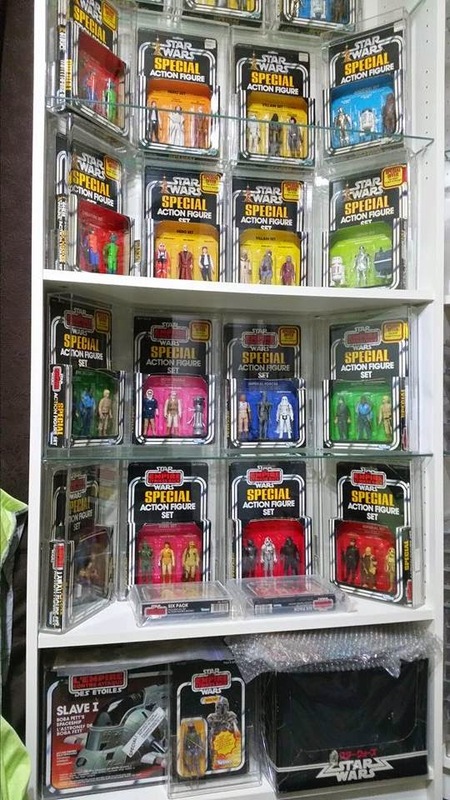 This was in the early days of eBay, my username was MarkY204Yeo and I started to see some of the prices that old Star Wars toys were going for. I was shocked by the going rates for items, so that started my interest in selling and also collecting long term. I met the guy from Falcons Hanger, and got the price lists. When I finished school I started collecting with my first paycheck, then eBay hit, it made it easier to collect and find things. It was a bit cheaper at that time. My first auction with eBay was interesting, as the seller didn’t want to sell me the item after I won. He noticed that I had 0 feedback, and the seller thought I was going to scam him. He thought there was no way that someone with 0 feedback was serious and was going to pay, even after I sent payment he thought something was wrong and wanted to cancel the transaction. I personally found this humorous and unbelievable, how would someone sitting with a money order for an item still think that the buyer didn’t want it? My first thought is the seller didn’t want to sell the item and was trying to get out of it, which used to be easier to do. On that note for you new collectors who don’t understand the loopholes and challenges with eBay back in the day, they were many and the processes were not as nearly defined and succinct as they are today. For the first several years everything was done by check or money order, feedback was different and there was no PayPal. Some of us long for some of the old features of eBay, while others are just happy that things aren’t as convoluted as they used to be, regardless what side of the fence you’re on, you have to admit these types of situations are far and few between in the modern age of eBay. FP: What is your most coveted piece in your collection? MY: If the building was on fire I’d just die in the fire. I have a few favorites, but out of the entire collection the Meccano Yoda is at the top of the list. It came from JC – Juan Carlos from Spain. It wasn't cheap, and I don’t think it was even on the market. The artwork is my favorite aspect, the condition is so great with a clear bubble. Another one is my Orange head Luke, came out on an ESB 41E, I have a pair of them. FP: How did you come-up with your focus? MY: I’ve never really had a focus. It was more opportunistic for me -- as things came my way, or I found items I would capitalize on items as they would come along. Out of everything in the collection the only thing I “hunted” for was the wind-up R2-D2. About 10 years ago I saw my first one on eBay. It was part of a scam as it was the prior to the PayPal days, and it was done via money order. So really there is no focus for Mark other than what he enjoys, which one could say is the best focus to have in the hobby. Some of us (like yours truly) crave structure and goals to keep us on track in the hobby. Without it we would veer off in multiple directions with lack of continuity. But hearing Mark say that he really doesn’t “hunt” for anything or that he really doesn’t have a focus is extremely admirable to me and in many ways humbling, as his collection is 10 times what I could ever hope to have and encompasses so many unique niches. As Mark and I continued we started to discuss something that happens to a lot of collectors -- frustration -- and ultimately a break from the hobby. MY: Around 2004 I lost a bunch of auctions, my career was taking off, and my internet connection was ticking me off as I was still on dial up. This coupled with timing of US ending auctions (middle of the night in Singapore) I took a break for 6-7 years. Most of my stuff went back in storage. I wish I didn’t stop but it was becoming frustrating to be a collector in a market that could be easily scammed, and where I was consistently spending an overwhelming amount of time on trying to win auctions at 3AM. FP: Take me through your collection shelf by shelf, or section by section. MY: 3 Packs, Some came from Tom Derby, I have a great rapport with Tom that has been built up over the years, speaking with him over the phone, he offered them up to me. MY: Variants – Creatures Set QC Sample, Top shelf came from Joe Barr (It was featured in Star Wars Archive) with Shadow Box -- it’s a an early version of the sets, the last run before production. These are my personal favorite pieces that we covered. 3 Packs at the top of the list in terms of difficult items to collect from the production run. If you want good condition examples they are going to be expensive, regardless if it’s the Creatures set or one of the many super rare ESB sets. Thus seeing prototypes for these is just jaw dropping, especially when there are 3 of them lined up. 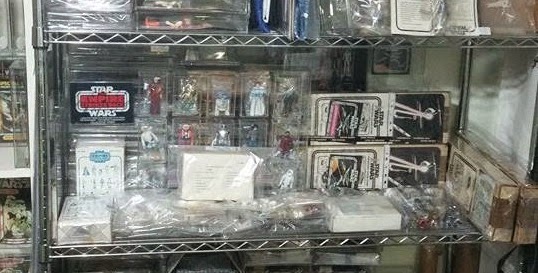 MY: I’m missing 2 Sets in the production run of the 3 Packs – Rebel set with Leia Hoth, and Bespin with Cloud Car Pilot. MY: My vacuum sealed figures came from Tom Derby -- a great acquisition and a center of one of the shelves. The 7 Figure MOC Set came from Tom Derby as well (starting to see a pattern here). It’s a Sears release, he was doing some research on his own and asked what other rare items I was looking for. He was able to find one, it’s a great piece with some great characters and the last one in the set is actually a vacuum sealed item. MY: Moving on to the Uzays – Blue Stars came from Michael in Germany, has a small crack in the bubble. The AT-AT Drier it came from Joe Y, two C-3POs from Adam Burgess in UK, Royal Guard without the cape was a BIN for $999 -- it was the first time I saw an Uzay and I made a $500 dollar offer on the $1000 listing and won it! The Royal Guard has a crack in the top of the bubble, the weapon can come out but not the figure. 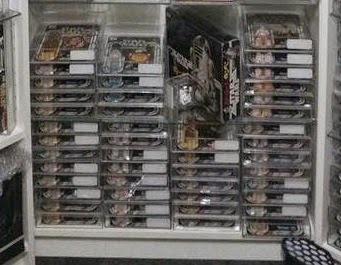 MY: The stacks of AFA figures are all 12 backs and is where I concentrated a lot of my efforts over the years -- 12A, 12A white stamps, 12B, 12 D (Full Set). It’s the focus inside the collection. MY: When it comes to Mailers my focus was more on the Sears lineup. I have two examples of the 15 pack (one graded and one not). The graded piece came from Tom Derby; one of which was featured in the MarketWatch last year (MarketWatch Feb. 2014). I bought the loose set missing 2 figures and found those on their own to complete the second set. I have one 4 pack that came from Tom as well -- it’s the one with Darth, IG-88, Bossk, and Fett it was graded 80. One 4 pack, went for $5,000. There’s one more 4 pack out there that I’m trying to find as well. I found the box itself and I’m trying to build it from that piece of the set alone. This was another item that was featured on the MarketWatch last year. FP: Are you done with your collection or what’s next for you? MY: I’ve always wanted to try to finish the 12 back variant line (missing double telescoping Ben and Vader). I’ve always found the 12 backs to be the most important to me in the line as my memories of the line are very vivid. It was right in the sweet spot of my childhood where I was playing with the items and that packaging stuck with me over the years. FP: How does your significant other feel about your hobby? MY: She has her own collections (shoes and bags), it’s the only way to even it out. She doesn’t like the time I spend with the collection vs. the cost, something that rings true with a lot of collectors in relationships. 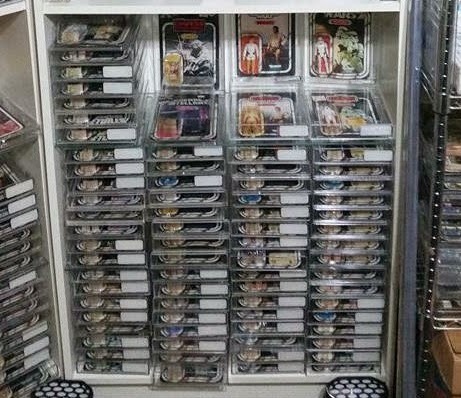 FP: How many other collectors are in Singapore? 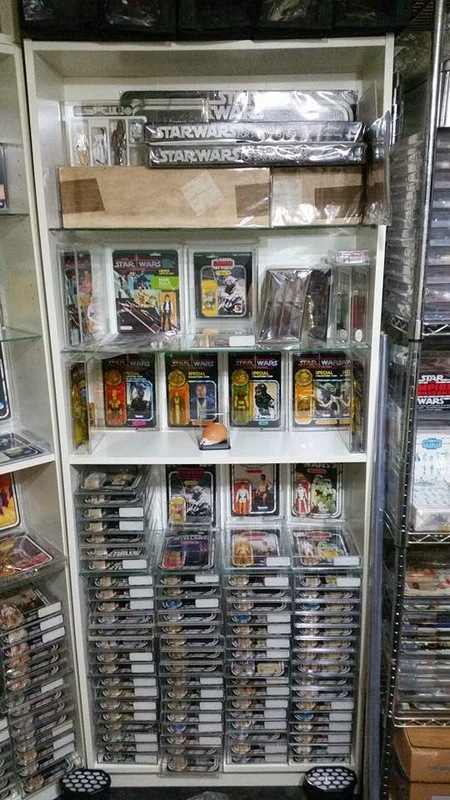 MY: There’s a few vintage collectors (Derek Ho – Uncle Gundy), he was one of the early ones who started in the 90s. Jeff Koh – (Only Boba Fett), 21 backs, a huge collection of them including one of the only proofs out there. It was impossible to fit in all the questions that I had for Mark as I wanted to be respective of his time, given the time zone difference, and the fact that this could have easily been a three hour conversation. Some of the areas we weren’t able to cover in detail include some of his random MOCs from ESB and ROTJ that you see in the images. In addition, we didn’t get a chance to dig into the Early Bird kits, Display Stands and other Mailers in any detail. Thus this may be a collection we revisit again someday just to talk through some more of these things. It was truly a pleasure to talk with Mark and hear more about his collection and understanding more of his focus and the background of how this massively detailed collection came to be. 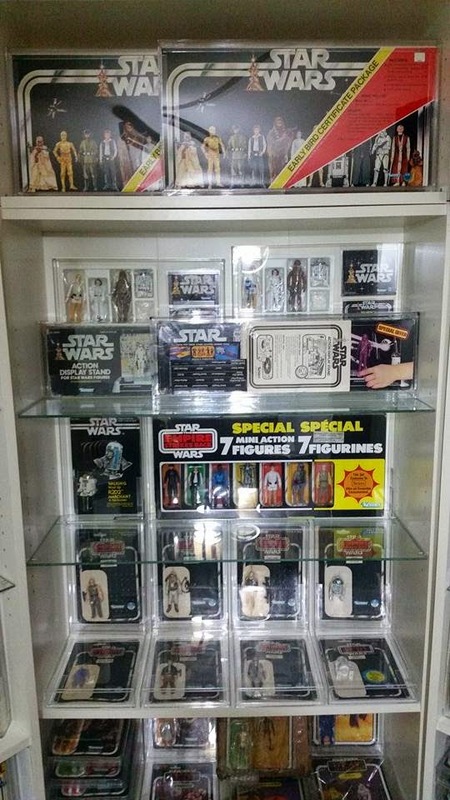 Mark gives back to the community through his reference posts, what he posts on RebelScum and displaying his collection for others to enjoy as well. One specific area of pride for him is the reference guides he’s posted on RebelScum, detailing the 12 back releases. These extremely detailed posts (Guide to US Kenner Star Wars Cardbacks) help show people what exists in the line and gives and additional point of reference to some of the existing matrices that are out there today. He made mention that a lot of people helped bring the guide together, and that it was very time consuming. He takes pride in accuracy and doesn’t want to mislead people so it’s taking a long time to compile the final version, and verify so that it’s completely accurate. This illustrates one of the great things about the hobby and those that have been part it for some time -- the ability to give back to the community and pass on what you have learned. Collectors pick up so much meta knowledge from other collectors, through posts, through interactions and through reference material. It’s the constant circle that makes this hobby great and helps it thrive and grow year after year. Mark is a true zealot in this sense and his contributions to the collecting community can’t go unrecognized. Mark’s collections spans so many sub focuses of the hobby that it’s difficult to keep track of all the niches in the collection itself. At the core of the collection is something beautiful, the fact that he is solely focused on things he enjoys collecting and has very loose goals for what he wants to acquire. I think that speaks miles to the impact of this collection. Many of us get caught up in our focuses and loose site of what collecting is truly about, that being enjoyment. Whether it’s getting upset over losing an auction for that key item, or dealing with eBay on some random issue a lot of us get brought down by our hobby vs. being lifted emotionally. For Mark like any other collector there has been frustration due to some of those challenges, but he’s always stayed focused on why he collects: the joy of the hunt. Personally I find this very admirable, and something to be modeled by other collectors. The collection itself is absolutely amazing and one of the best in existence today. The level of rarity of some of the items is enough to make one’s head spin when trying to comprehend the time and financial investment that must have been made to get to this level. From the detailed completeness of the 12 back set, to the foreign release items, the prototypes of 3 packs and everything in between it’s quite a site to see. If you haven’t checked out his collection yet, run and do so -- you won’t be disappointed. And if you take nothing else away from this article, please remember this: our hobby is about celebrating our lust for the past, the present and everything in between. Collecting is a means not an end, and those of us who truly get the most out of collecting don’t do so by having the most items, or by spending the most money. We do so by building a network of friends, developing relationships and creating stories out of not what we have materially, but what we’ve gained intangibly: friendships, stories, and knowledge. These are the true great benefits of our hobby. 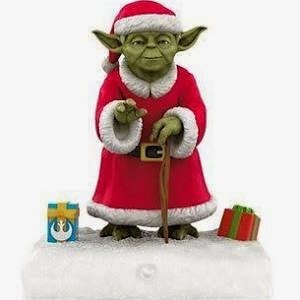 It is the time of the year to dust off your Hoth displays, decorate for the holidays and maybe, if you're like me, set up the Santa Yoda shelf. 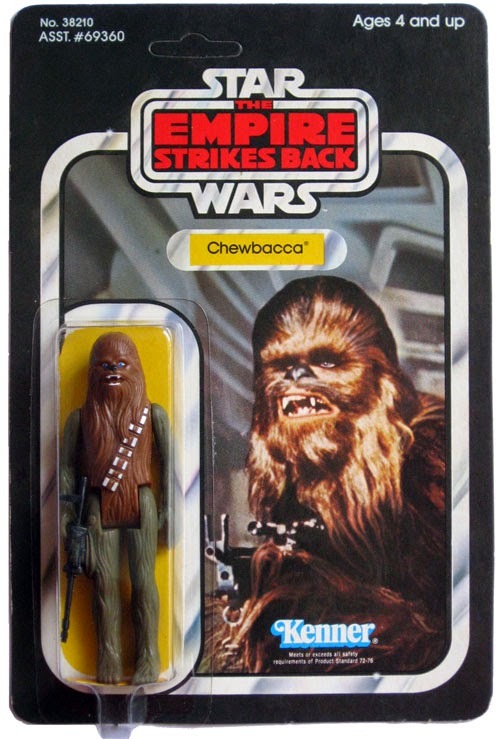 The marketing machine didn't really start until 2003 when Hasbro used the 1981 Lucasfilm card art for an action figure. 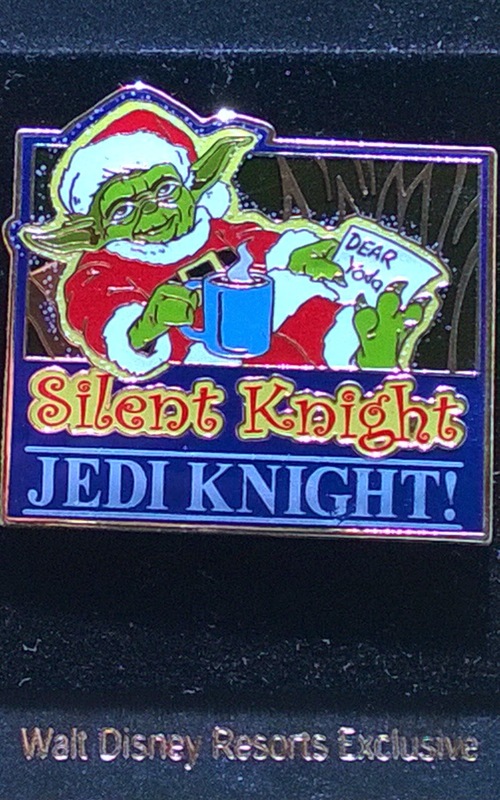 Incidentally, 2003 was also the year that the Disney parks came out with the 'Silent Night Jedi Knight' pin and tee shirt. 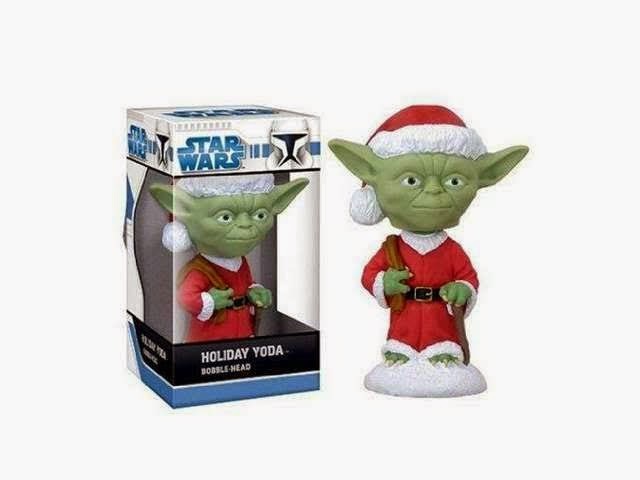 From then on, Santa Yoda exploded on the collector scene. 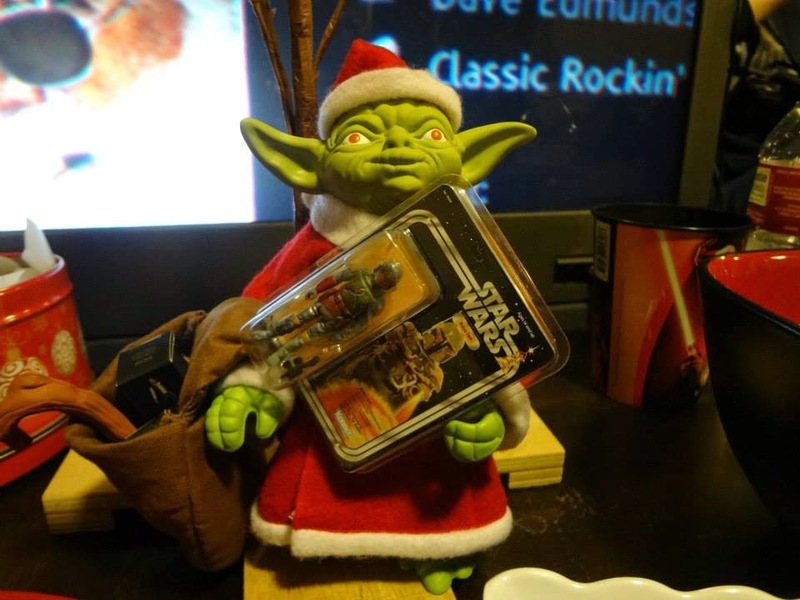 Licensees like Sideshow, Lego, Funko, Comic Images, and Kurt Adler joined in the Santa Yoda craze. The list goes on with lights, outdoor inflatables, plush, door greeters and more, this barely scratches the surface. 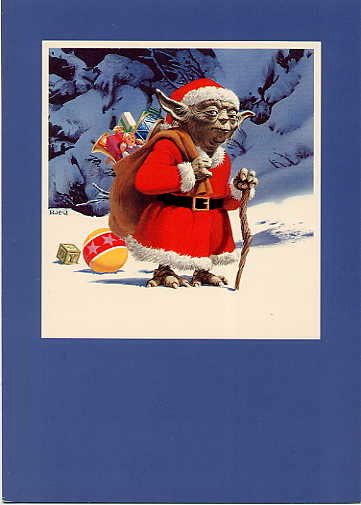 With the influx of collectibles, it is no wonder that Lucasfilm brought the 1981 Santa Yoda card back as a retro 2012 Holiday card. 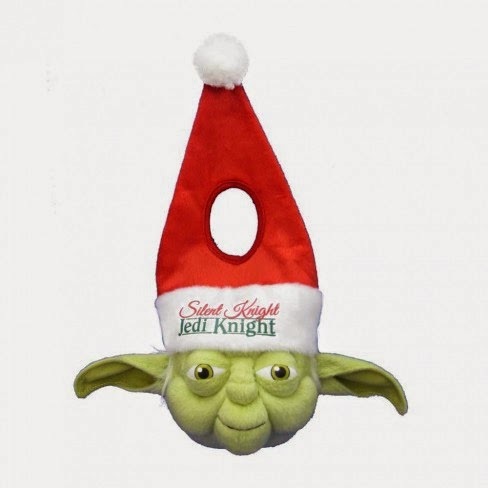 Gentle Giant was one of the notable Santa Yoda hold outs. 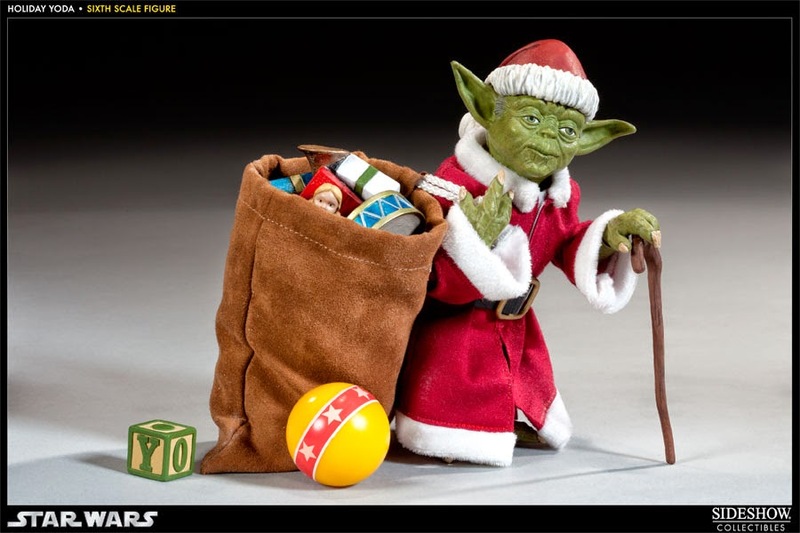 They waited until 2013 to introduce the ultimate collector item, the large scale vintage Santa Yoda figure. As this figure was not released in the vintage line, it marked the first real departure from their jumbo vintage figure series. 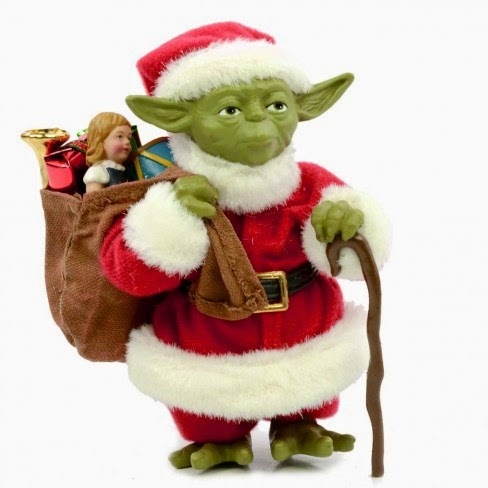 Many collectors chose to pass on Santa Yoda instead choosing to focus on the main figures in the line. 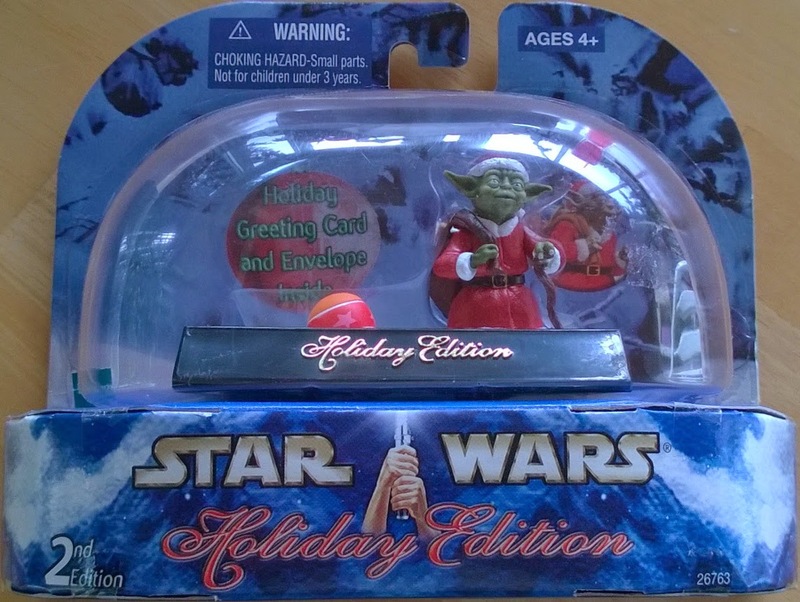 Then word got out that Yoda had a hidden gift in his bag, a mini fully articulated Boba Fett figure on card back. Gentle Giant re-opened orders for collectors now clamoring for the figure. After all of this, perhaps you've found some collectibles to add to your collection. 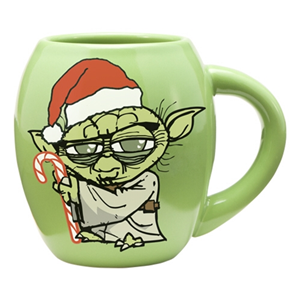 Guess there is nothing left to do but kick back with your Santa Yoda mug and work on your wish list. Special thanks to Tom Stewart for his collection photos.